A layered ponytail is a perfect hairstyle to add a new twist to a standard style. 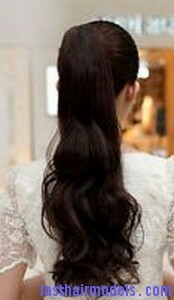 In this hairstyle, the hair will be divided into sections by wrapping them around your head to create a tiered ponytail. It can give a very elegant look that can be a suitable hairstyle for any type of formal event. This hairstyle will be liked by teenagers as it can look really cute. Just use this simple method to get this hairstyle without going to a hair specialist. To create this hairstyle, collect your hair from the hairline in front of the ears and brush it well until it becomes smooth. Secure the hair on top of your head at the crown using an elastic band. Then take out a small strand of hair from the ponytail and try to wrap it around the elastic band till the elastic is hidden. Secure your hair by tucking it underside of the elastic band or using a bobby pin. Next take the hair from the middle section which runs from top to bottom of the ears at the back of your head to create a ponytail and wrap it with a small piece of hair. 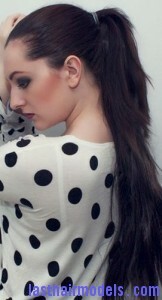 Now take the remaining hair to create a ponytail at the nape of your neck and hold it in place with a ponytail band. At last end the styling process by misting all over the hair with a hairspray to keep the hairstyle in place.